We found SMC Dolce Vita while we played ‘what is in the box’ last week, which is on a 83% off super sale at our website. 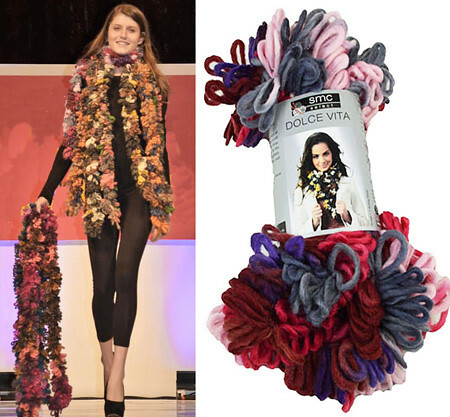 Dolce Vita is a single-ply wool blend that is constructed in loops and can be used to make scarves while using only your hands, which makes it a great gift for kids. Or, can be worked with knitting needles and/or a crochet hook. It can also be used as an embellishment for garments and felting projects. One skein is sufficient for a scarf but we are making a store sample with two skeins, which I think is nicer – we like long scarves. 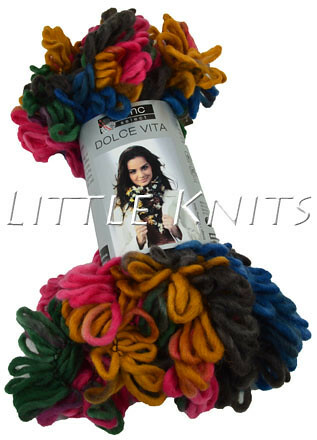 This fun and kooky yarn is unusual for Little Knits so we thought we would let you know about it.